Five jailed for murder of Russian reporter, but son asks: on whose orders? MOSCOW (Reuters) - Five men received long prison terms on Monday for the killing of prominent Kremlin critic Anna Politkovskaya after a trial that failed to reveal who masterminded the Russian journalist's murder. Politkovskaya, an investigative reporter who uncovered state corruption and rights abuses, especially in Chechnya, was gunned down in the lobby of her Moscow apartment block at the age of 48 on Oct. 7, 2006. The Russian authorities deny any role in her death. The case caused international outrage because of the brutality of the contract-style killing and the failure of the authorities - even now, after nearly eight years and several trials - to identify who commissioned it. Kremlin critics and rights campaigners say it symbolises the weakness of the rule of law in Russia. "I will be satisfied only when the person or people who ordered this will be sentenced," said Politkovskaya's son Ilya. 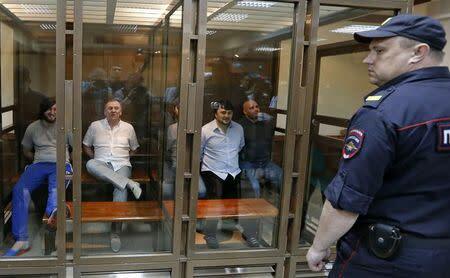 The five men, convicted by a jury last month, exchanged smiles in the defendants' glass box before judge Pavel Melyokhin handed down the sentences. He ordered life imprisonment for Rustam Makhmudov, found guilty of pulling the trigger, and his uncle Lom-Ali Gaitukayev, who organised the logistics. The other three received 12, 14 and 20 years. Politkovskaya was one of 23 reporters murdered in Russia since 2000, according to the New York-based Committee to Protect Journalists, and one of five from the same newspaper, the independent Novaya Gazeta. It is still running its own investigation into her death. "For as long as the name of the mastermind is not known, there can be no talk of revealing the truth," said Nadezhda Prusenkova, a spokeswoman for the paper. "Today's sentencing is important, but only a step. They are the lowest level in this criminal chain, which must still be revealed and punished." Tanya Lokshina, head of the Moscow office of Human Rights Watch, said that while the men were accused of killing for money, the trial had not established the ultimate motive for the crime. "At this point in time, it really does not seem that the government and investigation authorities are serious about getting to the bottom of it," she said. Federal investigators say they are doing all they can to find the mastermind. Makhmudov's two brothers, Ibragim and Dzhabrail, were sentenced to 12 and 14 years in a high-security penal colony for helping to shadow Politkovskaya. The fifth defendant in the year-long trial, former police officer Sergei Khadzhikurbanov, was given 20 years for his part in preparing the slaying. The court ordered the guilty men to pay 5 million roubles ($145,400) in compensation to Ilya and Politkovskaya's other adult child, Vera. At an earlier trial in 2009, a different jury embarrassed state prosecutors by acquitting three of the five defendants. Another ex-policeman was separately convicted and sentenced to 11 years in a penal colony, but his trial also failed to reveal the person or people behind the murder. Russian President Vladimir Putin condemned the murder at the time but infuriated Politkovskaya's supporters by saying her ability to influence Russian politics had been "extremely insignificant" and her killing had caused greater damage to Russia's image than her writing. Putin, a former KGB spy, has clamped down on dissent since returning to the Kremlin for his third term in a 2012 election marked by mass protests. Lev Ponomaryov, a prominent human rights campaigner who worked with Politkovskaya, voiced a widespread belief in Russia when he said that people in the higher echelons of power might have played a role in the killing.